UCU Left | After N30, where next? 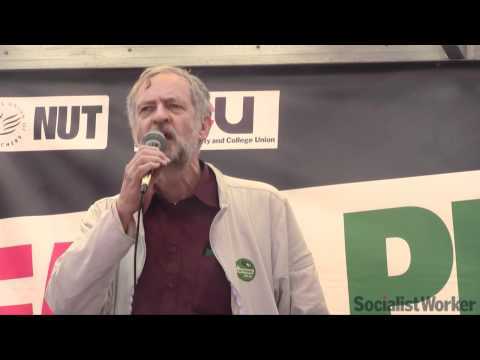 On Friday 2nd December 2012, the National Executive Committee (NEC) of the UCU decided unanimously in favour of a relaunch of the campaign in defence of public sector pensions as early as possible in the New Year. The NEC decided to seek the maximum unity with other public sector unions, and particularly with those whose members are engaged in delivering educational services, but to urge on other unions the importance of an immediate relaunch of the campaign after the Christmas break, and the importance of escalation of the action. • culminate in a two-day, 48-hour, stoppage in February. It agreed that this proposal should be taken by the UCU to the next joint education group meeting, and should also go to the TUC Public Sector coordinating group. Speaking as mover of the motion (see attached and below), Sean Vernell (tutor at City and Islington College) argued that a rapid relaunch of the campaign as soon as feasible in the New Year, was critical. The Government had threatened to impose the proposed cuts in pensions unless a deal is secured by Christmas. This threat was clearly designed to create an intimidatory framework for negotiations in an attempt to bully our side to concede on the key Government targets, and to undermine the unity of the unions’ resistance. The UCU, together with many other public sector unions’ national executives and conferences, is committed to making no concessions on our pensions. All negotiations need to proceed in good faith but jointly with preparations for a relaunch of the campaign. In moving the motion, he argued that the magnificent response of members in 30th November demonstrated the determination of employees across the public sector to resist the theft of their pensions to pay for a deficit created by the bankers. Members would not understand a significant delay in the campaign, and would become frustrated. There was an urgent need for a map of the future industrial strategy of the campaign to be laid out. 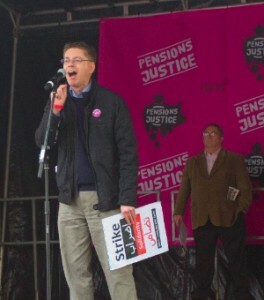 Seconding the motion, Tom Hickey (lecturer at the University of Brighton) argued that it was important that every Government Minister be left in no doubt that this was not a protest against a policy of which the unions disapproved. This was rather a campaign that the unions were determined to win. It is a campaign that is not going away after a one-day strike, and it is not a campaign that is merely seeking compromises over the Government’s proposals. For Government Ministers to be convinced required our side to decide on a campaign of escalating action, – from one day, to rolling action, to two days. It would only be such a public declaration that would concentrate Government Ministers’ minds. The mood of the rallies throughout the country on the 30th November confirmed that it was precisely this kind of strategy that union members across the public sector were seeking. Branches, regional committees, and national executives of all unions are urged to adopt this strategy by resolution. 1) 29 unions representing over 2 million public sector workers took strike action on the November 30. 2) The government threat to impose the changes in January and to introduce more trade union laws if the unions don’t agree to their demands. 3) That the NUT and PCS executives votes to consider escalating strike action as soon as possible in the new year including further nationally coordinated strike action. 1) That the government are attempting to divide the unions. They are trying to intimidate and bully the unions into accepting their paltry revised offers. 2) That, although the government’s attempt at an offer is totally unacceptable , it shows that the joint union campaign is having an effect. 3) That the 30th November coordinated strike has transformed the climate of resistance over the fight over pensions. 4) The government is isolated, nasty but weak. 5) That escalating the action quickly and significantly is the key to winning. 1) To propose at the next joint education group meeting that, should no acceptable outcome be achieved in negotiations, the next day of nationally coordinated action to be called as early as possible in the spring term. This day of action to be immediately followed by coordinated regional action. This action to be rolled out across the country creating a Mexican wave effect acting as a bridge to the next day of nationally coordinated strike action. This action to end with a 48 hour nationally coordinated strike. 2) To put this proposal to the TUC public sector coordinating group.